Circus memories are like old smells. Comfortable and warm, often very strong and mostly associated with food and animals, they can transport you back in time within a nanosecond. And while Circus Oz is definitely not from the eighties there are more than a few things which haven’t changed. From the very font used for the TICKET sign, the smell of popcorn and doughnuts to the typically uncomfortable hard seats the show definitely magicks you to another world for some serious good times beneath the Big Top. 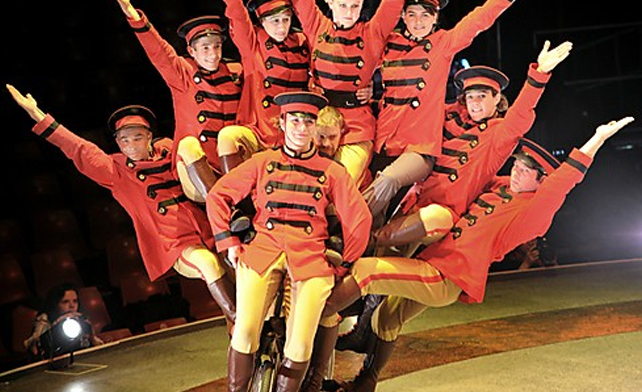 But times certainly have changed – no chattering monkeys, trumpeting elephants or lion tamers operate in this show. Neither are there any fire-eaters or sword swallowers. I’d much rather see feats of ability, strength and artistry performed by humans than animals who (not always but often) seem to be getting the blunt end of the stick – sometimes quite literally. The night opened with an introduction from the Ring Mistress (complete with top hat and tails) and accompanied by a fantastic band all enthusiastically participating in creating a series of bells and whistles for the very Victorian themed production of Steam Punk. A range of acts included Group Bike stunts, jugglers, magicians, incredibly strong women and a hilarious act of Red Kangaroos who bouncing their way around the audience created an amazing Aussie circus atmosphere. Children seemed particularly delighted with the Hoop Divers who demonstrating great flexibility and agility dived through rings of bamboo hoops as they gradually got higher, as well as with the lady in the “pwetty pwurple dwess” who nimbly balanced a square edged table on the soles of her feet. Also a huge favourite was the Rola-Bola man who showed that while hips swaying normally happen on the dance floor the circus re-invention on a set of planks and cylinders is a move that would certainly grab the limelight. A solid performance by all and if a few of the acts did seem to fall a wee bit flat let’s just remember that for the most part it’s a lot closer to the ground where we’re sitting. Even though this wasn’t an opera, it’s never quite over until the fat lady sings – and oh boy she wasn’t all that big but she certainly was a powerhouse who literally took the production to a whole new level. Well done Circus Oz for providing a great night of entertainment but also supporting people with hearing disabilities and making refugees feel welcome in Australia. Now that’s the Aussie spirit we can proud of.